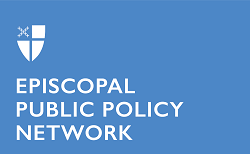 The Episcopal Public Policy Network is a grassroots network of Episcopalians across the country dedicated to carrying out the Baptismal Covenant call to “strive for justice and peace” through the active ministry of public policy advocacy. The network is part of the Episcopal Church’s Office of Government Relations in Washington D.C.
Join the Episcopal Public Policy Network to receive regular updates about the advocacy work of the church in Washington D.C. and action alerts on critical legislation in Congress. To learn more about the diocese’s social justice work or to find out more about a particular issue, email Deacon Fatima Yakubu-Madus.